The first destination winter resort in the U.S. was developed by W. Averell Harriman, the chairman of the Union Pacific Railroad, primarily to increase ridership on U.P. passenger trains in the West. The success of the 1932 Winter Olympics in Lake Placid, New York, spurred an increase in participation in winter sports (and alpine skiing in particular). A lifelong skier, Harriman determined that America would embrace a destination mountain resort, similar to those he enjoyed in the Swiss Alps, such as St. Moritz and Davos. During the winter of 1935–36, Harriman enlisted the services of an Austrian Sportsman, Count Felix von Schaffgotsch, to travel across the western U.S. to locate an ideal site for a winter resort. The Count toured Mount Rainier, Mount Hood, Yosemite, the San Bernardino Mountains, Zion, Rocky Mountain National Park, the Wasatch Range, Pocatello, Jackson Hole, and Grand Targhee areas. Late in his trip and on the verge of abandoning his search for an ideal location for a mountain resort development, he backtracked toward the Ketchum area in central Idaho. A U.P. employee in Boise had casually mentioned that the rail spur to Ketchum cost the company more money for snow removal than any other branch line and the Count went to explore. Schaffgotsch was impressed by the combination of Bald Mountain and its surrounding mountains, adequate snowfall, abundant sunshine, moderate elevation, and absence of wind, and selected it as the site. Harriman visited several weeks later and agreed. The 3,888-acre (15.73 km2) Brass Ranch was purchased for about $4 per acre and construction commenced that spring; it was built in seven months for $1.5 million. Publicist Steve Hannagan named the resort "Sun Valley" and developed the tag line: “Winter sports under a summer sun." (Count Schaffgotsch returned to Austria and was killed on the Eastern Front during World War II.) The centerpiece of the new resort was the Sun Valley Lodge, which opened on 21 December 1936. The 220-room, X-shaped lodge's exterior was constructed of concrete, poured inside rough-sawn forms. The wood grain was impressed on the concrete finish, which was acid-stained brown to imitate wood. The Swiss-style Sun Valley Inn (originally the "Challenger Inn") and village were also part of the initial resort, opening in 1937. Hannagan wanted swimming pools at the resort, "so people won't think skiing is too cold." The world's first chairlifts were installed on the resort's Proctor and Dollar Mountains in the fall of 1936. (Proctor Mountain is northeast of Dollar Mountain). The U.P. chairlift design was adapted by an engineer recalling banana loading conveyor equipment used for tropical fruit ships' cargo. Single-seat chairlifts were developed at the U.P. headquarters in Omaha in the summer of 1936. The chairlift went on to replace primitive rope tow and other adaptations seen at ski areas at the time. The original Proctor Mountain Ski Lift is listed on the National Register of Historic Places. Author Ernest Hemingway completed For Whom the Bell Tolls, while staying in suite 206 of the Lodge in the fall of 1939. Averell Harriman had invited Hemingway and other celebrities, primarily from Hollywood, to the resort to help promote it. Gary Cooper was a frequent visitor and hunting/fishing partner, as were Clark Gable, Errol Flynn, Lucille Ball, Marilyn Monroe, and several members of the Kennedy family. Hemingway was a part-time resident over the next twenty years, eventually relocating to Ketchum ("Papa" and his fourth wife are buried in the Ketchum Cemetery). The Hemingway Memorial, dedicated in 1966, is just off Trail Creek Road, about a mile northeast of the Sun Valley Lodge. Sun Valley was featured (and promoted) in the 1941 movie Sun Valley Serenade, starring Sonja Henie, John Payne, Milton Berle, and bandleader Glenn Miller. Scenes were shot at the resort in March 1941. Sun Valley transfer local and future gold medalist Gretchen Fraser was the skiing stand-in for Henie. In February 1958, the cast of "I Love Lucy" filmed an episode of their follow-up series of hour-long specials, known in syndication as "The Lucy-Desi Comedy Hour", at Bald Mountain. In 1971, Apollo 15 astronaut Jim Irwin, when stepping upon the surface of the Moon's Hadley–Apennine, the avid skier exclaimed that it was like Sun Valley. Sun Valley's oldest resident was former actress and silent movie star Barbara Kent. Another resident was actress Ann Sothern, whose career spanned six decades and included 64 movies and 175 television episodes; she is buried in the Ketchum cemetery. After the war, the resort's clinic operated on the third floor of the northern wing of the Sun Valley Lodge (wing closest to the Trail Creek Rd.) until the Sun Valley Community Hospital was built in 1961. That facility was named after Dr. John Moritz when he retired in 1973; the Nebraska-born surgeon had served as the resort's year-round physician for 33 years. The Moritz Hospital was closed shortly after the new St. Luke's branch hospital opened (south of Ketchum) in November 2000 and the Moritz building now serves as employee housing. After World War II, Harriman focused on his career in government service and the Union Pacific gradually lost interest in the resort. Rail service was discontinued to Ketchum in 1964 and that November the resort was sold to the Janss Investment Company, a major Southern California real estate developer headed by a former Olympic ski team member, Bill Janss (1918–96), founder of Snowmass. (Janss was an alternate on the 1940 team, but the games were cancelled due to the war). The railroad's management had called in the Janss Corporation as consultants and it was determined that it would take a lot of work and no less than $6 million for a face-lifting. The Union Pacific decided to sell and brothers Ed and Bill Janss bid just under $3 million. During this Janss era of ownership, the north-facing Warm Springs area was developed, as well as Seattle Ridge, and condominium and home construction increased significantly. Seven chairlifts were added, and the number of trails increased from 33 to 62. The first two double chairs on Warm Springs were installed in series in 1965; the upper "Limelight" had a 2,200-foot (670 m) vertical rise, the greatest in the U.S. at the time for a chairlift. The original Seattle Ridge double chairlift was installed in 1976, but due to a very poor snow year in 1976–77 it was not operated until December 20, 1977, christened by local legend Gretchen Fraser. Janss also has a ski run named after him, called "Janss Pass," to the skier's left of the Frenchman's chairlift. Janss' wife Ann, age 54, died in 1973 while helicopter skiing near Sun Valley. Later that year, Janss married Mrs. Glenn Cooper, a widow, family friend, and mother of five, including World Cup racer Christin Cooper, silver medalist in the women's giant slalom at the 1984 Winter Olympics. 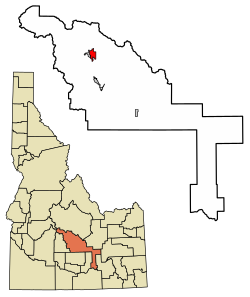 Under Janss' ownership, the Elkhorn area southeast of Dollar Mountain was developed by the Sun Valley Company and Johns-Manville, beginning in 1972. During excavation, ancient tools dating back nearly 7,000 years were discovered. Elkhorn's golf course was opened in the summer of 1975. Janss was running low on funds in 1977 and had entered into negotiations to sell the resort to the Walt Disney Company. While the negotiations were strung out by Disney, Earl Holding, a Utah businessman, learned of the situation through a small article in The Wall Street Journal and contacted Janss and arranged for a meeting. For about $12 million, Holding purchased Sun Valley through his company, Sinclair Oil, which operates the Grand America Hotels & Resorts. Holding was initially distrusted by many locals: "Earl is a Four Letter Word" was a popular bumper sticker in the late 1970s in Blaine County. But time proved that Holding did not buy the resort for property speculation; like his other assets he meant to operate and improve for the long-term. One of his first changes was the removal the archaic single-seat chairlift on Exhibition, replacing it with a triple. A daily lift ticket for Baldy during Holding's first season (1977–78) was priced at $13. In 1977, the Warm Springs side boasted 100 acres (0.40 km2) of snowmaking up to an elevation of 8,200 feet (2,500 m), thought to be the highest anywhere at the time. During the late 1980s and early 1990s, snowmaking was significantly expanded on Bald Mountain. Three high-speed quad chairlifts were installed during the summer of 1988 (Christmas, Challenger, & Greyhawk). An impressive day lodge, constructed of logs, river rock, and glass, opened at the base of Warm Springs in the fall of 1992, replacing the 1960s "Northface Hut" cafeteria. Similar day lodges were later opened at the Seattle Ridge summit (1993), and the River Run base (1995). A fire of undetermined origin damaged the Warm Springs lodge in 2018; it occurred shortly after the end of the ski season, while unoccupied at night in mid-April. An older cafeteria, the modest one-floor "Lookout Restaurant," is 120 feet (37 m) below the summit at 9,030 feet (2,750 m), at the top of three chairlifts. Built 46 years ago in 1973, it is the ground floor of a multi-story building that was never completed, resulting in its "basement-like" atmosphere. Nevertheless, the mountain views from this near-summit lodge are quite impressive. However, the resort's recently[when?] approved master plan has the facility slated for eventual replacement. Four additional high-speed quads were installed in the 1990s. Two of these replaced older chairlifts on River Run (1992) and Seattle Ridge (1993), and two cut brand new paths: Lookout Express (1993) and Frenchman's (1994). The chairlift from River Run was purchased by Eldora Mountain Resort in Colorado. Baldy's 13 chairlifts have a capacity of over 23,000 skiers per hour. With an average of 3,500 skiers per day (& less than 6,000 skiers per day during peak periods), Sun Valley has kept the lift lines to a minimum, a rarity among major resorts. In the final season before the launch of the World Cup, Sun Valley hosted the world's top racers in 1966 at the "American International" in late March, with a full slate of races for both men and women. With the 1966 World Championships not run until August, it was one of the biggest alpine racing events since the 1964 Olympics. The Austrians swept the men's downhill (Heini Messner, Karl Schranz, and Egon Zimmermann), while Jean-Claude Killy of France won the slalom, with Schranz as runner-up. The two switched places in the one-run giant slalom. Erika Schinegger of Austria, Nancy Greene of Canada, and Marielle Goitschel of France were the top three in the women's downhill, while Goitschel and teammate Annie Famose finished 1–2 in the slalom. Goitschel, Greene, and Famose were the top finishers in the giant slalom and France took the overall team title. The 1975 slalom was won by Gustavo Thoeni, the dominant World Cup skier of the early 1970s (which turned out to be his last win in the slalom discipline). A young Ingemar Stenmark of Sweden, perhaps the greatest technical ski racer ever, took the giant slalom title both years. Thoeni and Stenmark left Idaho tied in the overall standings in 1975, which Thoeni won in the finals of a parallel slalom the next week in Italy. Phil Mahre of White Pass, Washington, age 19, won the 1977 slalom race over Stenmark, with twin brother Steve placing third. It was Phil's second win (he had won a GS in France in December), but his first victory in the slalom and first in the U.S., and being from the Northwest, very close to home. 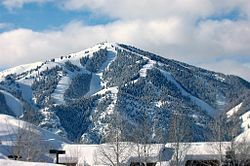 Sun Valley is scheduled to host the U.S. Alpine Championships in 2016 and 2018, held after the World Cup season in March. It last hosted the event in 1951. The non-profit Sun Valley Center for the Arts and Humanities was initiated in 1969 by Mrs. Glenn Cooper and Bill Janss, who later married. It attained non-profit status and was officially founded in 1971; the original 5-acre (20,000 m2) campus was located off Dollar Road in Sun Valley. Studios and workshops were open to the public and focused on Ceramics, founded by James Romberg; Photography, founded by Sheri Heiser and Peter deLory; and Fine Arts, founded by David W. Wharton. The SVC offered year-round workshops, lectures, and exhibitions by nationally recognized artists and craft persons to both residents and tourists to Blaine County. Today the Sun Valley Center for the Arts has its main building in nearby Ketchum as well as a historic house and classroom in Hailey, and continues to present an impressive list of guest artists in the visual and performing arts. In 2014, FOCUS Mountain Media, a publishing group based in Sun Valley, launched a quarterly magazine about mountain culture with a specific view towards life in Sun Valley. The southern area of Elkhorn, adjacent to Dollar Mountain, has its own condo complex and 18-hole golf course. Quite distinct and separate, including a drier "sagebrush" appearance, it was initially developed in 1972. The Sun Valley Company took over day-to-day operations of the Elkhorn Golf Club in July 2011 and named Rick Hickman director of golf operations for the company. On September 11, 2005, the Dalai Lama visited Wood River High School in Hailey to give a speech on understanding and friendship in remembrance of the September 11, 2001 Attacks and offered condolences to the many thousands affected by the recent Hurricane Katrina. Sun Valley is located at 43°40′50″N 114°20′34″W﻿ / ﻿43.68056°N 114.34278°W﻿ / 43.68056; -114.34278 (43.680491, −114.342711), at an elevation of 5,945 feet (1,812 m) above sea level. According to the United States Census Bureau, the city has a total area of 9.89 square miles (25.61 km2), of which, 9.88 square miles (25.59 km2) is land and 0.01 square miles (0.03 km2) is water. As of the census of 2010, there were 1,406 people, 622 households, and 367 families residing in the city. The population density was 142.3 inhabitants per square mile (54.9/km2). There were 2,597 housing units at an average density of 262.9 per square mile (101.5/km2). The racial makeup of the city was 96.4% White, 0.2% African American, 0.2% Native American, 0.8% Asian, 0.1% Pacific Islander, 1.0% from other races, and 1.3% from two or more races. Hispanic or Latino of any race were 4.6% of the population. As of the census of 2000, there were 1,427 people, 594 households, and 343 families residing in the city. The population density was 144.6 people per square mile (55.8/km²). There were 2,339 housing units at an average density of 237.1 per square mile (91.5/km²). The racial makeup of the city was 92.43% White, 0.35% African American, 0.42% Native American, 0.77% Asian, 4.20% from other races, and 1.82% from two or more races. Hispanic or Latino of any race were 7.15% of the population. Part of Abbott and Costello's 1943 film Hit the Ice was shot at Sun Valley. The Esther Williams vehicle, "Duchess of Idaho," was shot and set in Sun Valley. The movies Bus Stop (1956) starring Marilyn Monroe, I Met Him in Paris (1937), Sun Valley Serenade (1941) and Ski Party (1965) were partly filmed in Sun Valley.